When you hit a bump, your shock absorbers damp the wheel’s motion by converting its kinetic energy into heat via the shearing of fluid in the shocks. That heat gets expelled into the air and is never seen again. But Audi is tired of wasting energy, so the automaker plans to harness it from the suspension motion and convert it into electricity. The idea of a regenerative shock absorber is nothing new. MIT showed one off late last decade that pushed fluid through a turbine attached to a generator. 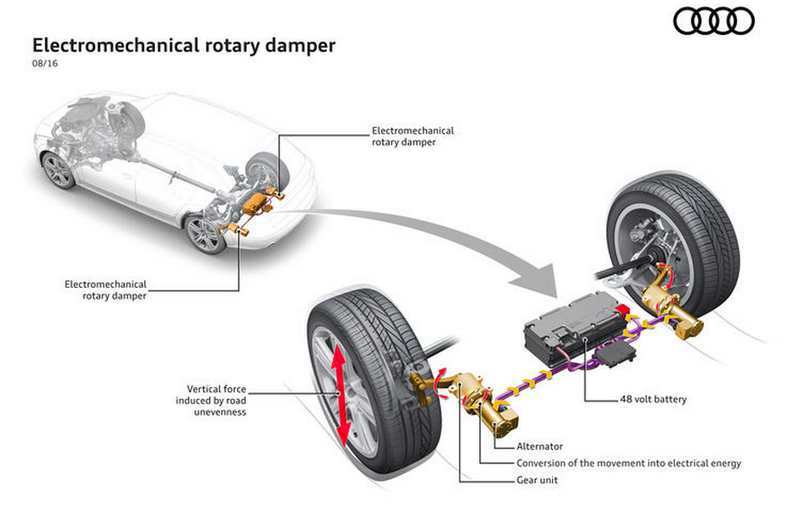 But Audi’s new system, called eROT, is even simpler, and also acts as an adaptive damper. eROT uses a lever arm attached to the car’s suspension to rotate an alternator via a gear set. As the wheel goes up and down, the lever arm translates the linear motion into rotational motion of gears and ultimately the shaft, which spins a rotor in an alternator, inducing current in the stator and BOOM, you’ve got electricity recharging the 48 volt lithium-ion battery. The system works the other way as well, with the 48 volt battery fine-tuning the electromechanical rotary damper, adjusting it continuously to suit driving conditions. Audi says the adaptive system allows the damper to “...[eliminate] the mutual dependence of the rebound and compression strokes that limits conventional hydraulic dampers.” So that means you can have a soft compression stroke and a firm rebound. The company says that in addition to the energy recuperation and continuous damping capability, the new system is also beneficial from a packaging standpoint, providing additional interior space since it’s horizontally-mounted, whereas most traditional telescoping shocks are mounted vertically. This is an interesting system, and one that Audi says could very well make its way into their future products, some of which will incorporate a 48 volt electrical systems. More interior space, better fuel efficiency, nicer ride comfort—sounds good to me, so long as the company can keep cost and weight down.